Ryan Butler is considered the best weight man in Wyoming track history, and the only national champion the sport has ever seen. While winning the NCAA Title in the 35-pound weight throw at the 1996 NCAA Indoor Championships, the native of Idaho Falls, Idaho, set a personal best mark of 71′ 1.5″ to crush the field and win by nearly two-and-a-half feet. At the time, his effort was the fourth best all-time mark by an American-born collegian, and 11 inches off the American collegiate record. Butler also was the WAC indoor champion in the event that year. At various times during his career, he also was Western Athletic Conference runner-up in the hammer, discus and shot put events. He finished his career with three All-American honors, two in the 35-pound weight throw, and one in the hammer throw. 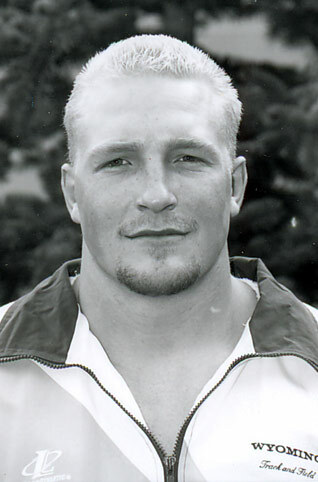 He finished fifth at the 1995 NCAA Indoor National Championships in the 35-pound weight throw as a junior, his first NCAA Championships appearance. Butler would finish his Cowboy career with eight All-Conference honors in the 35-pound weight, the hammer, the shot put and the discus throws, a great demonstration of his athletic ability. He also would set UW school records in the 35-pound weight, and the hammer throws. He also would finish as the number two discus thrower and number five shot putter in UW history. He qualified for the 1996 Olympic trials in the hammer throw, but a back injury prevented him from competing.